Broadway, classical, world music and more! 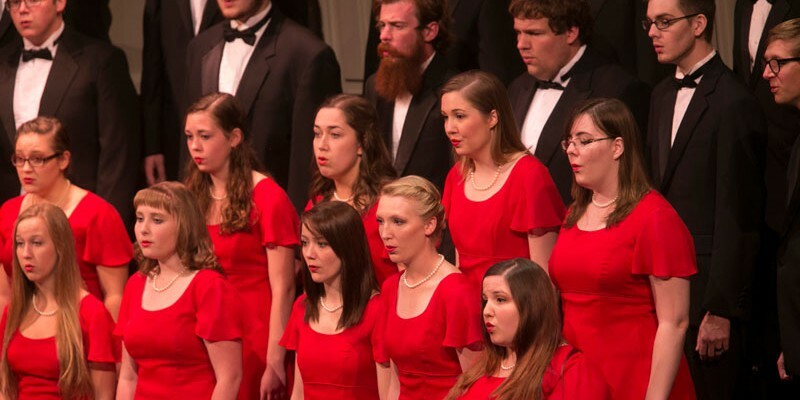 Known for stirring performances at home and abroad, the sounds of Friends University choirs range from the intimacy of the Jazz Vocal Ensemble to the majesty of the 200-voice Choral Union. Under the leadership of Dr. Mark Bartel, Rolaine Hetherington, Craig Curry and special guest conductors, the voices of Friends University are sure to inspire you! For more information on all Fine Arts events and ticket information, visit the Fine Arts Events & Tickets page. Musical by Marsha Norman and Lucy Simon. Produced by special arrangement with Samuel French, Ltd. The Singing Quakers, Concert Choir and Jazz Vocal Ensemble will share the stage with some of Kansas’ top high school choirs for this day-long festival. For more information, please call 316-295-5677. The evening concert will be at 7:30 p.m. in Sebits Auditorium and will feature guest conductor, Tesfa Wondemagegnehu.